Infographic: What’s on the Mind of Healthcare IT Security Professionals? Am I investing in the right things? How do I know I’m cyber secure? The infographic provides an overview of the areas of concerns for healthcare IT professionals. Business Associate Manual is template-style manual that can be easily adapted to align with your compliance needs as a business associate (BA). All content complies with the Omnibus Rule. It is specifically developed to help BAs meet complex privacy & security compliance requirements. Posted in Health Information, Health IT, Infographics | Comments Off on Infographic: What’s on the Mind of Healthcare IT Security Professionals? 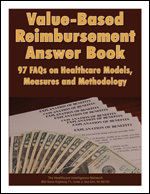 Despite new CPT codes that reimburse physician practices for select chronic care management (CCM) services, almost half of healthcare organizations lack a formal CCM program, leaving critical reimbursement dollars on the table, according to 125 respondents to the Healthcare Intelligence Network’s (HIN) 2015 Chronic Care Management survey, conducted in January 2015. However, 92 percent of respondents believe the Medicare CCM reimbursement codes that became effective January 1, 2015 will prompt equivalent quality overtures from private payors, underscoring care coordination’s importance in a value-based healthcare system. We also asked respondents how they structured their CCM programs, and who had primary responsibility for CCM services. Following are their responses. Almost 45 percent of respondents to HIN’s 2015 CCM survey have yet to launch a CCM initiative, the survey determined. A diagnosis of diabetes is the leading criterion for admission to a CCM initiative, said 89 percent of respondents with existing CCM programs. A primary care physician or healthcare case manager most often bears primary responsibility for CCM, say 29 percent of survey respondents. Just over one-third of respondents  35 percent  are currently reimbursed for CCM-related activities. Patient engagement is the most difficult challenge of CCM, according to one-third of survey respondents. The majority of CCM tasks are conducted telephonically, say 88 percent of respondents. Almost three-quarters of respondents  72 percent  admit patients with hypertension to CCM programs, respondents said. Healthcare claims are the most frequently mined source of risk-stratification data for CCM, say 72 percent of respondents. More than half of respondents  51 percent  include palliative care or management of advanced illness in CCM programs. On average, each CCM patient is seen monthly, say 29 percent of respondents. New CCM codes offer physician practices both a business opportunity and a path to providing value-based healthcare. For physician practices yet to embrace a patient-centered medical home or accountable care organization (ACO), the new Medicare Chronic Care Management (CCM) code offers another benefit besides added revenue: the chance to test-drive a value-based healthcare delivery model. 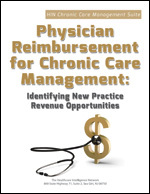 Billing via the new CPT code 99490 is “an opportunity for practices to develop the infrastructure to become a medical home or to participate in an ACO,” noted Nicole Liffrig Molife, counsel with Arnold & Porter during a February 2015 webinar, Chronic Care Management Reimbursement Compliance: Overcoming Obstacles and Meeting Requirements. The law firm, which counts the American Geriatric Society among its clients, has closely monitored the development by CMS of the CCM code, which reimburses practices for select non face-to-face care coordination tasks previously bundled into Evaluation and Management (E&M) codes. “[CMS] has been pretty explicit…that they conceive of this code as a transition toward an alternative payment model,” added Paul Rudolf, MD, a partner with Arnold & Porter. The transitions seems inevitable, given the federal payor’s aggressive timeline for transitioning Medicare payments to value-based models announced last month. Transforming themselves via this added CCM payment would jump-start development of the technology, communications and staff required for practices to provide complex, coordinated care management for Medicare beneficiaries with multiple chronic conditions, said Dr. Rudolf, a former practicing physician&#151activities at the heart of patient-centered healthcare models. The two attorneys walked through the requirements to bill CCM, including patient eligibility, professional eligibility, patient consent, care coordination services, specified practice capabilities, and specified use of an electronic health record (EHR). Until Medicare provides more clarity, practices should thoroughly document CCM activities and, where necessary, consult their in-house ethical professionals and specialty societies to protect themselves, Dr. Rudolf said. Noting the proliferation of CCM guidance in the marketplace, some of which may appear inconsistent and conflicting in nature, he advised providers to vet thoroughly any CCM advice before implementation. Click here for an interview with Dr. Rudolf. 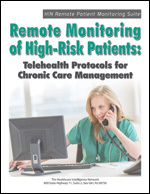 Telemedicine is one of the fastest growing sectors in healthcare, according to a new infographic by MANA. With increased pressure for healthcare cost efficiency and cost reduction, this growth is expected to accelerate. The MANA infographic compares the telehealth market in 2010 and expectations for 2016, along with expected growth rates for home-based and hospital-based telehealth technology. Kevin Watson is CEO of Netsurion, a provider of cloud-managed IT solutions. The country’s second largest health insurer, Anthem Inc., has confirmed it is the latest to join a growing list of major corporations to have suffered a serious data breach. Kevin Watson, CEO of Netsurion, outlines some of the consequences of stolen healthcare data and suggests five steps businesses can take to protect themselves from electronic data theft. Unlike many recent data breaches, Anthem was quick to publicly announce the breach only days after discovering that personal information on as many as 80 million of its customers and employees had been stolen. In this case, it appears the hackers used rather sophisticated methods, managing to gather names, dates of birth, social security numbers, addresses and email addresses. Although it does not appear any medical information or financial records were exposed, the information that was taken is more than enough to steal the identities of the affected individuals. For so long, the focus of data breaches has been on credit card data, as stolen credit card data can so readily be turned into cash or goods. However, with the increasing popularity of EMV or chip and pin enabled credit cards, the prevalence of data breaches involving personal information may again rise to the forefront. This is especially true when one realizes the value of a stolen identity can often be far greater over the long term than the value of a stolen credit card. If access to insurance plan information were to have been stolen along with identity information, data thieves would have a good indicator as to which identities were of higher value based on the value of the insurance plan. If thieves focus on the individuals with the highest plan costs, these are likely the people who are more established in their lives, have families, higher incomes and better credit, meaning their identities are worth even more on the black market. When permitting remote access to a network, it is essential that this access is restricted and secure. At a minimum, access should only be granted to individual (not shared) user accounts using two-factor authentication and strong passwords. Remote access activities should also be logged so that an audit trail is available. It is critical to keep all anti-virus/anti-malware software up to date with the latest versions and definitions. The companies that make anti-malware software monitor threats constantly and regularly update their packages to include preventive measures and improvements to thwart malware seen in other attacks. Much like anti-virus/anti-malware updates, designers of operating systems are constantly improving their software to prevent hackers from stealing data, especially if a criminal manages to bypass the built-in security. It is essential that the latest security releases and patches be installed on all systems. In addition to blocking unwanted traffic from getting into a location, it is always a good practice to selectively block outgoing traffic as well. Many modern breaches involve software that becomes resident on a company network and then tries to send sensitive data to the hacker’s system via the Internet. No system can completely prevent unwanted malware or viruses, so a good last line of defense is making sure secure data doesn’t leave the network without prior knowledge. The same firewall used in Step One should be configured to monitor outgoing traffic as well as incoming. Netsurion is a leading provider of cloud-managed IT security services that protect small- and medium-sized businesses’ information, payment systems and on-premise public and private Wi-Fi networks from data breaches and other risks posed by hackers. Netsurion’s patented remote installation technology and PCI compliant cloud-based solutions simplify the implementation process and ongoing support. Any sized branch or remote office, franchise or sole proprietor operation can use Netsurion without the costs of onsite support. The company serves the retail, hospitality, healthcare, legal and insurance sectors. Three out of four physicians are using mobile apps at work, according to a 2014 report by MedData Group. There are now more than 10,000 apps available in the healthcare category, as physicians use mobile to save time, lower costs, and improve their quality of care. 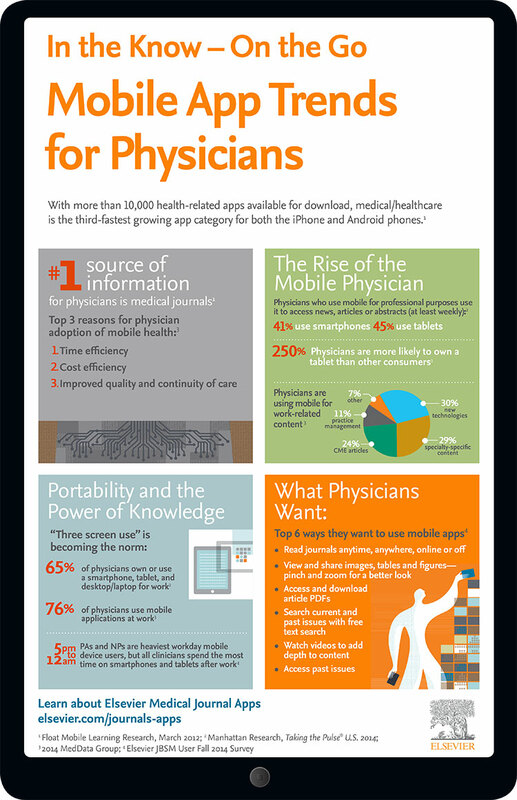 A new infographic by Elsevier looks at the top reasons physicians use mobile technology, “three screen use,” and what physicians want from mobile apps. 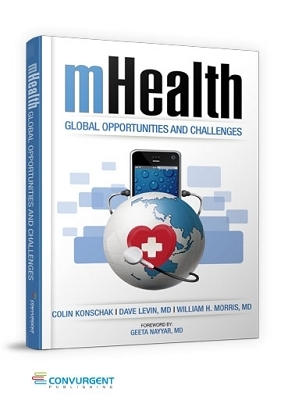 mHealth: Global Opportunities and Challenges provides a practical guide for patients, providers, payers, and other healthcare enterprises making plans for the future. The authors offer several examples of real world application of mHealth technologies in use throughout the United States, Europe, Africa, Middle East, and in the Far Eastern region of the world.